Do you play games on facebook? I have to admit I do. But, I digress, I play a few of the games while sitting on hold or watching TV late at night. 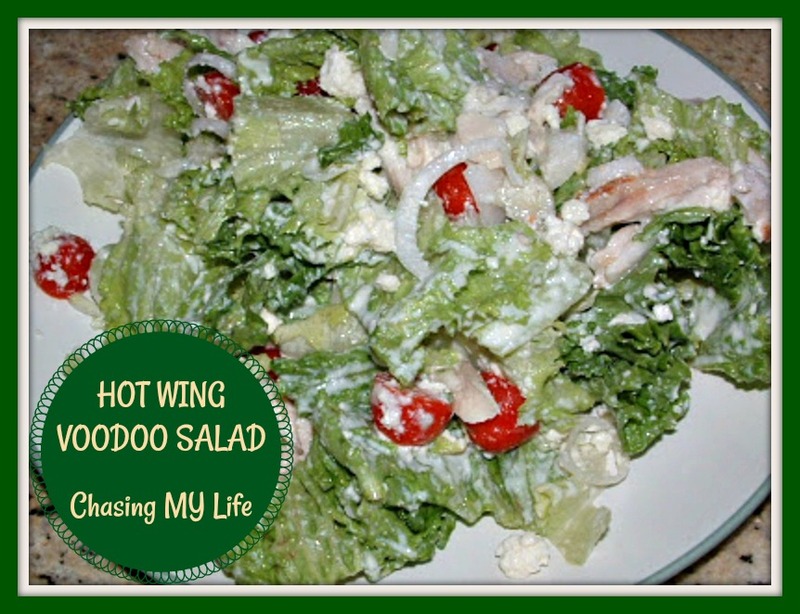 One of the things that came to mind was CAFEWORLD 6-7 years ago and I thought, “are these real recipes?” So, I did a search for some of the cool ones and I did find a recipe for VOODOO CHICKEN SALAD, but it was nothing like I expected so I am made my own! I prepare the chicken breasts the same as you would HOT WINGS. While you’re doing this, have the butter melting in the pan. Start with 4 tablespoons and add as necessary, but make sure you don’t run out dry. As the last batch is frying melt 4 tablespoons of butter in a flat bowl. To that add 1/2 cup of Frank’s hot sauce. Whisk them together well. Toss the torn lettuce, onion and tomatoes with the lemon and lime juice. Add cooled chicken pieces and bleu cheese crumbles. Pour on the desired amount of dressing and toss well.